Leading haredi rabbinic figure passes away Tuesday morning following sudden deterioration of his condition. 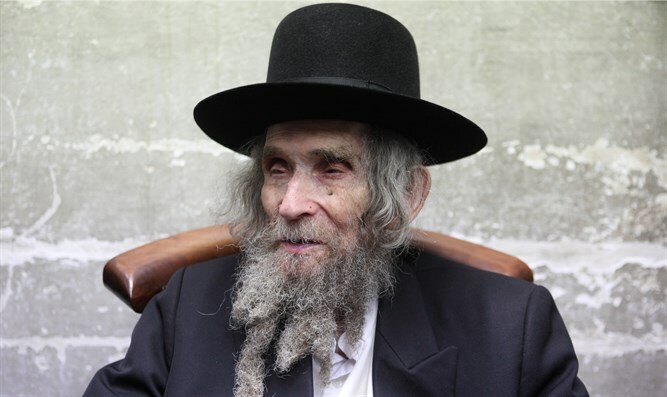 Rabbi Aharon Yehuda Leib Shteinman, one of the most widely respected decisors of Jewish law in the haredi community, passed away Tuesday morning at the age of 104. Rabbi Shteinman was considered the leader of the Lithuanian haredi Jewry since the death of Rabbi Yosef Shalom Elyashiv. He was head of the Council of Torah Sages of the Degel Hatorah representing Lithuanian haredi Jewish community. Rabbi Shteinman studied in Lithuanian yeshivot between the two world wars. In his early twenties he was first appointed as a teacher, and in the 80-some years since then he taught Torah, in yeshivot in Switzerland and in Israel. His public involvement began in the 1960s, when he focused mainly on encouraging the opening of kollel studies in Israel. He served as an adviser and mentor on education in the Lithuanian community. With the establishment of the Degel Hatorah Council of Torah Sages in the late 1980s, he joined the Council, and since then his public influence has expanded. Since the death of Rabbi Shach in 2001, he stood alongside Rabbi Yosef Shalom Elyashiv as a leader of the Lithuanian public. After the death of Rabbi Elyashiv, Rabbi Shteinman led the Lithuanian community and was considered the supreme spiritual authority of the Degel Hatorah party, its newspaper Yated Neeman, as well as the Lithuanian educational institutions and yeshivot connected to the party. Rabbi Shteinman initiated the establishment of yeshivot and kollelim in Israel and abroad, and served as president and patron of some of them. He headed the Ponevezh kollel, and the yeshivot Gaon Yaakov and Orchot Torah. Until the beginning of the 21st century he also served as head of the Ponevezh yeshiva for youth. Rabbi Shteinman wrote about thirty books, including a series of books on the Babylonian Talmud and the Torah.